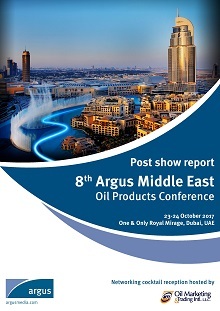 Download a copy of the 8th Argus Middle East Oil Products Conference post-show report. Fill out the form on the left and submit to receive a copy of the report straight to your email inbox. Notice:By accessing this site you agree that you will not copy or reproduce any part of its contents(including,but not limited to,single prices,graphs or news content) in any form or for any purpose whatsoever without the prior written consent of the publisher.